Pushing Myself to Two PRs in Two Weeks! On Tuesday of last week I was feeling a small inkling of shin soreness by Wednesday it was noticeable enough that I had to bring it up with my run coach. She had me take a rest day on Thursday and then a light day on Friday. I could still feel the soreness a bit on Friday but it wasn’t bad. On Saturday I ran 4.5 miles and didn’t feel the soreness at all – whoo! Before I started working with a run coach I used to focus on distance all the time. I thought all of my runs should be at least 5K with a longer run on the weekend. However, when I started working with Coach Joy I noticed she put a lot of 2 mile runs into my schedule. At first I was a little bummed to see this because I thought it meant she didn’t think I could handle running longer distances multiple times per week, but recently I’ve seen exactly why she puts two mile runs into my schedule. The two mile runs are just short enough for me to really push myself. In fact I’ve cut 3 minutes off my 2 mile time in the last two weeks! I’m not doing any kind of sprint drills or anything like that, I’m still following the 3 min run/30 sec walk intervals, but I am without a doubt running faster. The increased speed during my shorter runs has led to an increased speed in my longer runs. On Saturday I cut over 5 minutes off my previous 4 mile PR! Before Coach Joy my long run was 6 miles but so much of that distance was covered in walking since I was doing short run/walk intervals. Today I feel like a much stronger runner even if my long run distance is shorter. Speaking of distance, sometimes I feel really strange saying I’m in training for 13.1 when in fact my first half marathon isn’t until February of next year. Really I’m in training for a 10-miler but that doesn’t sound nearly as cool as 13.1 (plus the 10-miler is part of my half training). I’ve been thinking about maybe swapping out the 10-miler for a real Fall half but I haven’t made a final decision on that yet. It seems like so many people have great memories of doing a runDisney race as their half or full marathon, and I can definitely see myself weeping like a baby with happy tears while running 13.1 in Disney… tough decision here! DO IT!! do the Allstate 13.1 in November. You have enough time to train hard for it. Taking any time off such a short run is a HUGE accomplishment! Taking 5 mins off 2 miles means you cut 2.5min/mile off your pace! That’s insane. Great work! Thank you! Although I only cut 3 mins off my 2 mile PR (5 mins off my 4 mile PR), but I’m still thrilled! 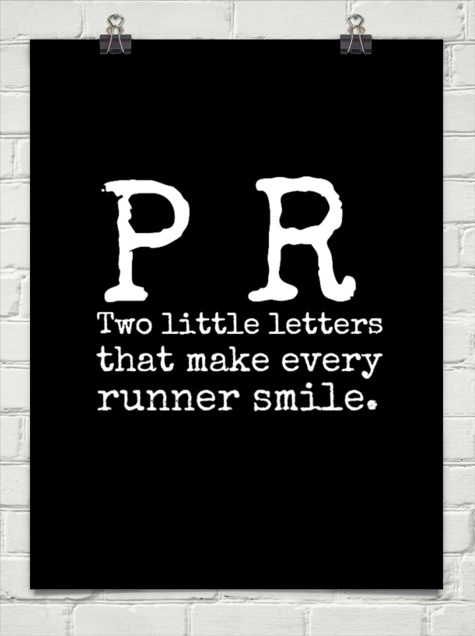 🙂 And congrats again on your 5K PR from over the weekend!! Congrats!! It feels so good when your hard work pays off! You’ll find that you’ll just keep getting faster and faster. As for swapping the 10-miler for a half, you can always decide last minute. Or add the Nov 13.1 if the 10-miler goes well in Oct! congrats on dropping time!! It doesn’t matter the distance as long as you are having fun!